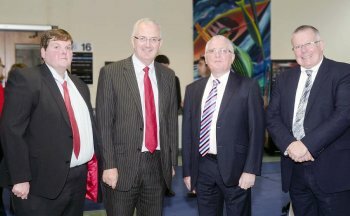 The University of Ulster is hosting the 2012 Irish Transport Research Network (ITRN) Conference at its Jordanstown campus – the first time the event has come to Northern Ireland. Delegates from a number of universities across Ireland, the UK, Czechoslovakia and Malaysia have been presenting research findings during the two-day event. University of Ulster academics are giving research presentations on a number of transport related issues. Keynote speakers at the event are internationally renowned transport experts Professor Margaret Grieco from Edinburgh Napier University and Professor Kay Axhausen from ETH Zurich. Professor of Transport at Ulster, Julian Hine, said the conference was an important opportunity for transport researchers throughout Ireland to disseminate research findings. “The University has a transport research group within the Built Environment Research Institute (BERI) and, as the 2012 ITRN organisers, it demonstrates how important our research activity is to the wider transport community,” he added. Ulster is a founding member of ITRN, which aims to bring together transport researchers from across the island of Ireland. The conference was opened by Regional Development Minister Danny Kennedy who stressed the importance of investment in transport infrastructure.